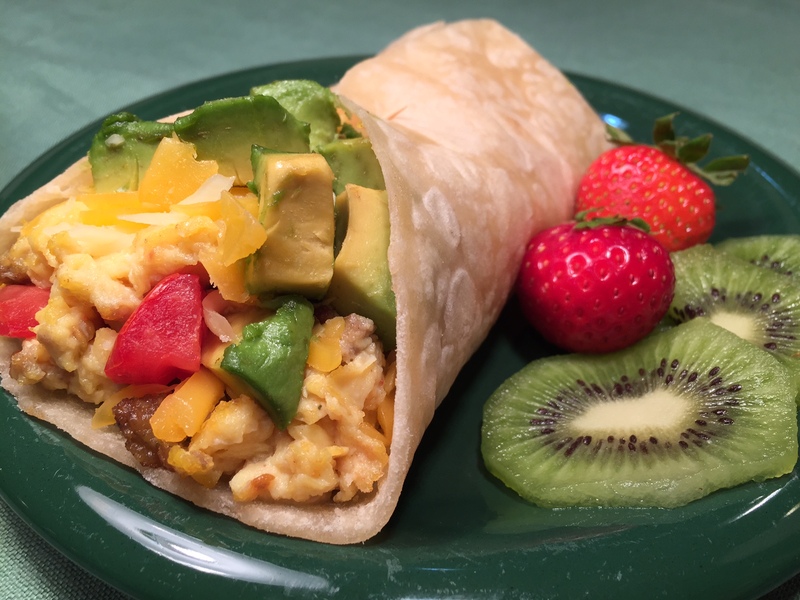 BREAKFAST BURRITO – A Fast & Easy Dinner! Who doesn’t love breakfast food for dinner? By then, we’re wide awake enough to enjoy it. Plus, the last thing I want to do in the morning is cook – which is why my breakfast consists of tea & biscuit. Breakfast Burritos are more a concept than a specific recipe. Generally, they include scrambled eggs, but after that – the sky’s the limit: avocado, tomatoes, cheese, peppers, “sausage”. Whatever you have on hand. Awww – I hear the murmuring. “Sausage”??? Isn’t this a vegetarian blog? Note the quotation marks around sausage – that means imitation. You might cringe at the fake stuff, but “sausage” is one of those imitation products that tastes amazing. I use Morningstar’s Sausage Patties, and even my carnivorous brother loved them (I didn’t tell him ahead of time). It’s best to have all your ingredients chopped and tortillas warmed, so that when the eggs are done you can stuff and go. Of course, you can zap them in the microwave, too. stuffings: avocado, tomato, peppers, etc. Warm tortillas in microwave and keep in plastic gallon sized bag, foil, or tea towel. Scramble eggs and add in torn up “sausage” patties. Layer eggs/”sausage” on tortilla, followed by your other add-ins. (Don’t overstuff or you’ll never be able to wrap the tortilla.) Top with cheese and fold up tortilla. APPLE RICE SALAD – The Perfect Side Dish! With the approach of Autumn, we bid farewell to one red fruit (the tomato) and hello to another (the apple). There are a large number of apple orchards in my neck of the woods, and it’s been a long tradition in my family to trek to the foothills for the annual apple festival. I like to take advantage of locally grown produce – not only does it taste fresher and more flavorful, but I believe in supporting farmers in my area. Note: There’s a fabulous article about apples by Helen Nichols, 34 Science-Backed Health Benefits of Apples, that will inspire you to try not only my Apple Rice Salad, but many others as well. Of special interest is a description of the various types of apples, and the dishes in which they work well. Be sure you make plenty, because this is a crowd pleaser! Cook rice. Let cool when done. As the rice is cooking, mix the dressing. In a small bowl blend the balsamic vinegar, olive oil, honey, Dijon, garlic, and salt. 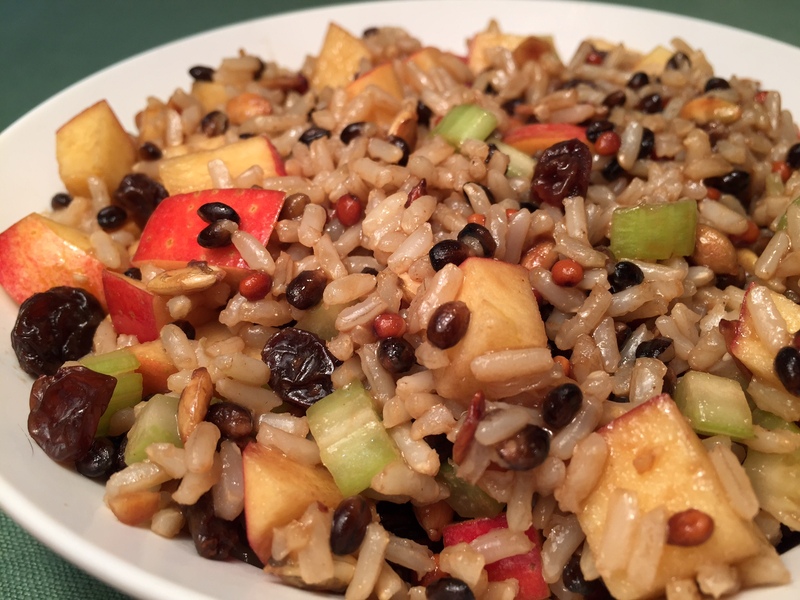 Mix together the cooled cooked rice, apple, celery, raisins, and dressing. Refrigerate. At serving time, stir in the sunflower seeds. Want A Spicy Date? 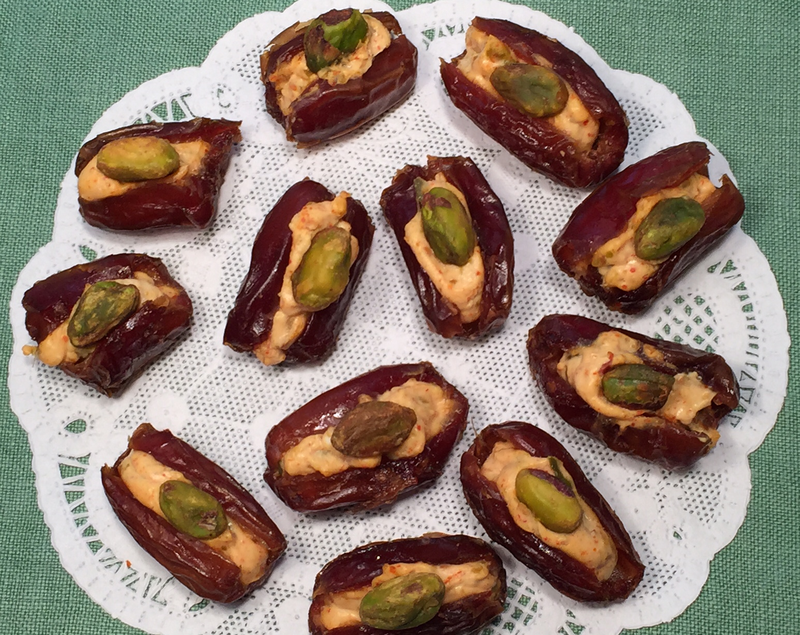 Try SWEET & SPICY STUFFED DATES! I love to entertain. Even though I plan mass quantities of food for the meal and desserts (notice the plural – there are always at least 3 desserts), hors d-oeurves are a fact of life. There has to be a selection of tidbits to tide everyone over because guests arrive at various times and, quite often, cooking takes longer than expected (sigh!). SWEET & SPICY STUFFED DATES are a delightfully diverse combination of sweet and tangy, creamy and crunchy…with a kick! The filling is easy to prepare, and the dates can be stuffed ahead of time. Apply the pistachio nut topper at the last minute to make sure it’s nice and crisp. NOTE: Cayenne pepper is potent stuff – a little goes a long way. Vary the amount to suit yourself. But bear in mind, the spiciness gets diluted by the date, so don’t just try the filling – put some on a date to taste-test. 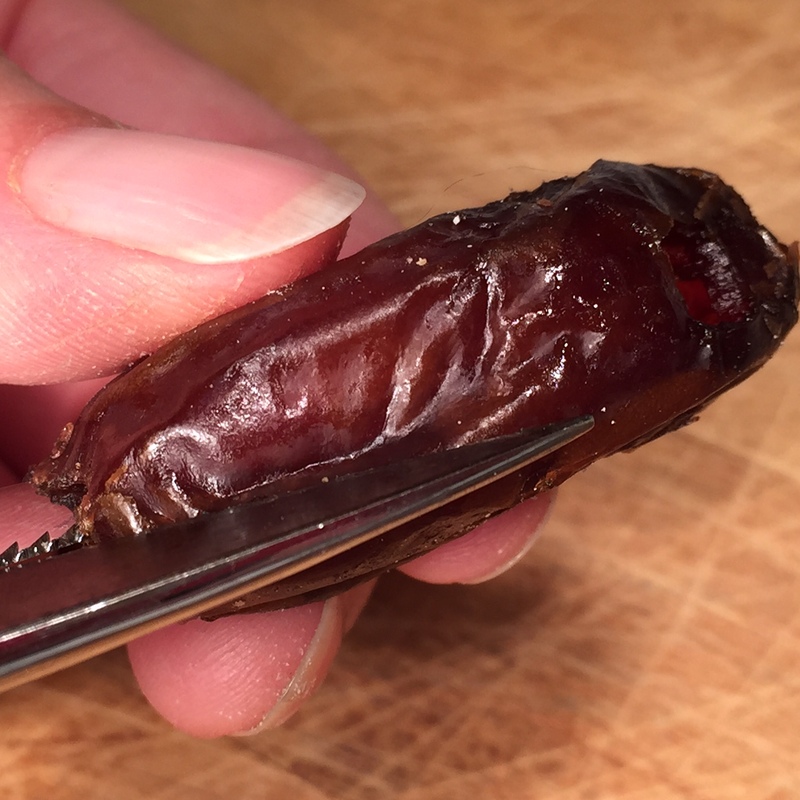 Slice open each date by sticking the tip of a blade of your kitchen shears into one pit hole and cutting lengthwise to the other pit hole (see photo). Finely chop (but don’t grind) the 1½ T pistachio nuts. (I used the small pitcher of my Oster blender since I hate to chop). Mix together the cream cheese, chopped pistachios, cayenne pepper, and capers. 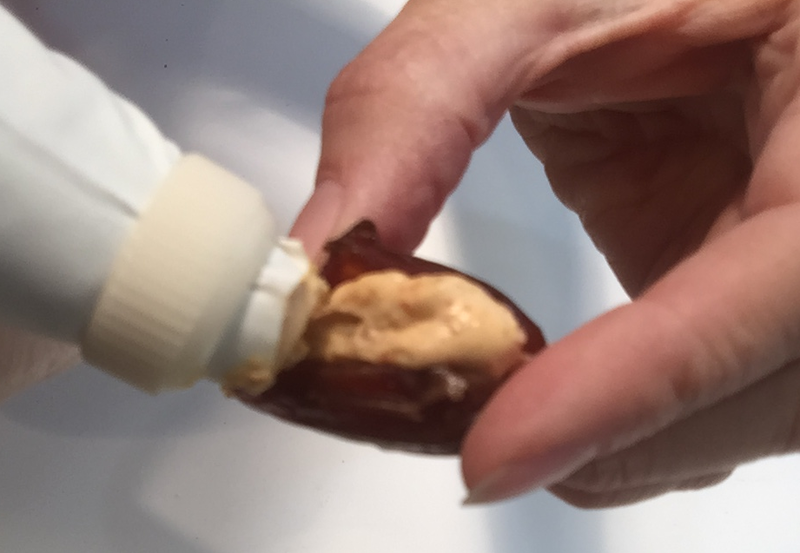 The easiest way to stuff the dates is to spoon mixture into a pastry bag (see photo) and squeeze the filling out. This works great, especially if you’re making a lot. But you can, also, just use a spoon to fill the dates. Hold open slit date and squeeze in filling. If you’re not serving these immediately, cover and refrigerate. To serve, top each with a whole pistachio nut. Sometimes I find myself in a meal-time rut, especially when I’m busy (which is a frequent occurrence as a wife, mom, actress, and writer). So every now and then I rummage through my recipe box for forgotten gems. Many of these are from my carnivore days of yore. But now, with the advent of some very tasty imitation meats, I’m able to substitute the fake stuff for real beef, chicken, ham, etc. CAUTION: Not all of these products are created equal. Some are excellent, some are nasty. Try different brands to see which (if any) appeal to you. A bonus to using imitation meats is that they’re already cooked. 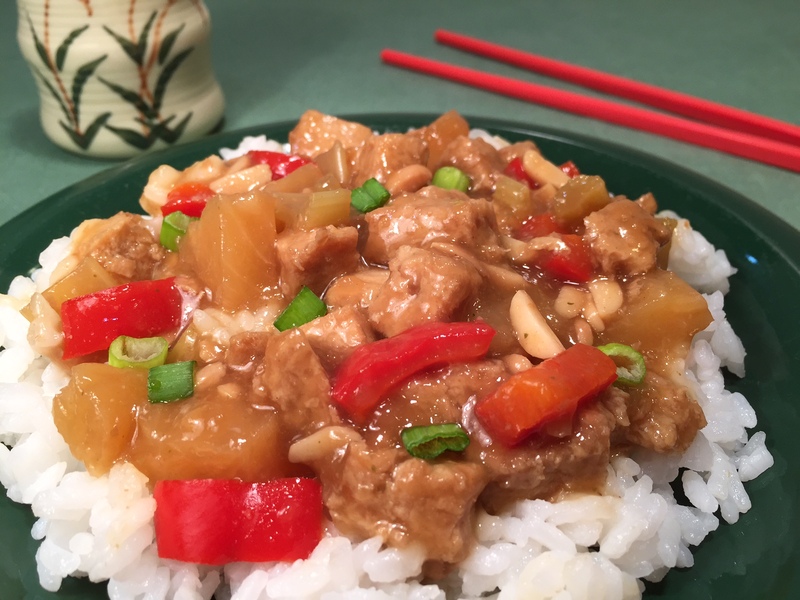 When I used to make the original Chinese Chicken Casserole, it would take me 30 minutes to boil the breasts, then they’d have to cool, and finally I would cube them (an unpleasant job). All that took about an hour. By using faux chicken, this recipe becomes one of those throw-everything-into-a-casserole dish, mix, and bake recipes. Fast and easy – my favorite! Note: My fake chicken of choice is by Worthington (see photo). It may seem a little pricey at first glance, but unlike real chicken, every bit is edible – no skin, fat, or bones in this baby! Plus it’s already cooked. Of course, there are other brands out there that are also good. Drain the pineapple juice into a measuring cup. Drop in vegetable bouillon cube and smash with a spoon to break it up. Add in enough water to equal 2 cups. Into a casserole dish combine all the ingredients. Cover with lid or foil and bake at 375º Fahrenheit for 40-45 minutes, stirring now and then.